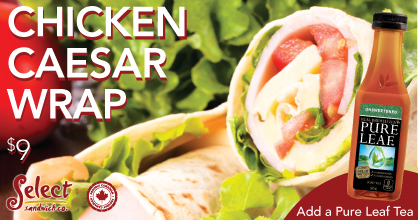 Back by popular demand at all Select Sandwich locations, our Chicken Caesar Wrap for only $9. A sliced Grilled Chicken Breast on a bed of Crispy Lettuce with Juicy Tomatoes and our signature Caesar Salad Dressing all wrapped in a soft, fresh wrap of your choice; white or whole wheat. Available all Summer Long at all Select Sandwich locations.